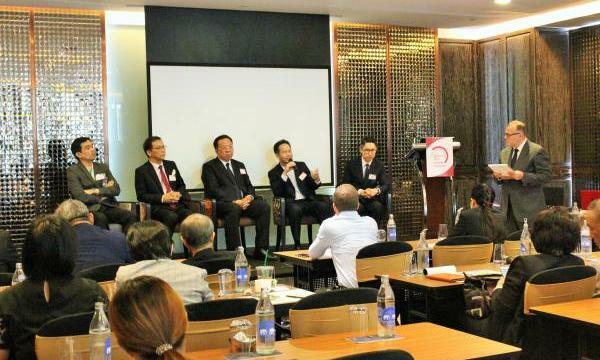 Executives from Thailand's big hospitals and healthcare firms converged at the event. Healthcare Asia successfully closed its 4-city 2018 Healthcare Asia Forum road show with a jam-packed event at Hilton Sukhumvit Bangkok Hotel on 30 May with almost 60 delegates flocking to the venue. Mickael Feige, partner at Solidiance, was among the thought leaders as he discussed the current healthcare challenges Thailand is facing. Budi Raharjo Legowo, CFO of Siloam Hospitals Group tackled financial hurdles of hospitals whilst Thongtana Permbotasi, deputy director at the Ministry of Public Health talked about the challenges and opportunities beyond the healthcare reform. Feige, Legowo, and Permbotasi were joined by Visit Vamvanij, director of Siriraj Hospital in a panel discussion that delved into healthcare reforms amidst rising costs. Chin Tuck Piew, administrator at Gleneagles Kuala Lumpur, also flew in to discuss how managing panpower cost and retaining talents can help hospitals and healthcare firms. Olarik Musigavong, assistant hospital director at Chaophya Abhaibhubejhr Hospital, talked about tough times for the country's medical tourism industry. The same topic was further fleshed out in a panel discussion participated in by Musigavong, Chin, and Tullawat Pacharapha, COO of Vejthani Hospital. Catch up on what transpired during the event here. Details of the 2019 Healthcare Asia Forum will be rolled out soon. Interested speakers and sponsors may contact Andrea Pascual at andrea@charltonmediamail.com or at +65 3158 1386 ext 212.